Luxury Comedy has its fair share of insane moments, with particular favourites of mine including human-shell hybrid, Daddy Push, and that cruel piece of French toast. 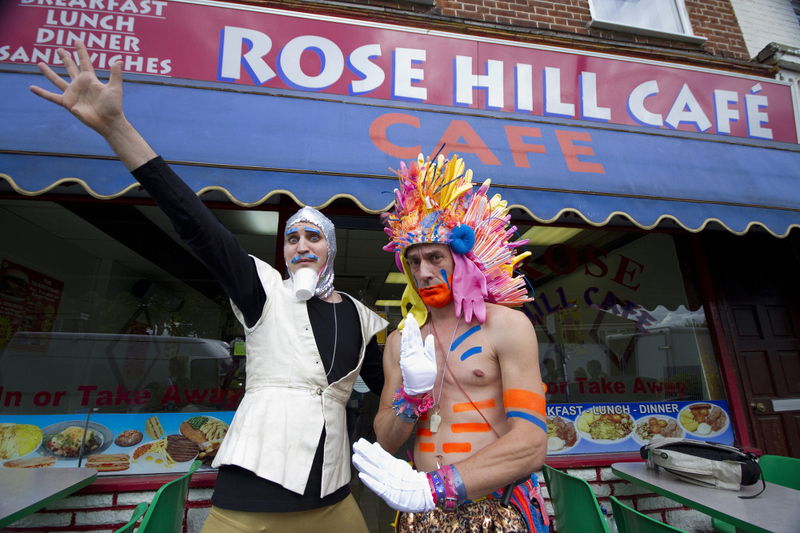 Series two (which was shown in summer 2014) saw the move of the zany group from their tree-house to a coffee shop on the edge of a volcano in Hawaii, and though many characters also made the transition, various new faces appeared too. For examples, audiences were introduced to the show’s biggest (and apparently only) fan, a Brummie called Terry, played by Steve Oram. Fielding has confirmed that he doesn’t intend write a third series of Luxury Comedy, but many characters have found their way into his new live show, so all hope is not lost. I think everyone’s favourite Mighty Boosh character has to be Old Gregg (played by Fielding), and it’s not surprising. With his creepy mannerisms (did you see what happened to Curly Jefferson? ), yet prevalent sense of neediness (“do you love me?”), its only natural to be wary of this guy, but maybe we all relate to him a bit. Other magical Boosh moments included the arrival of the Crack Fox, Howard Moon’s coconut friend named Milky Joe, and Nanageddon, a pensioner from hell. 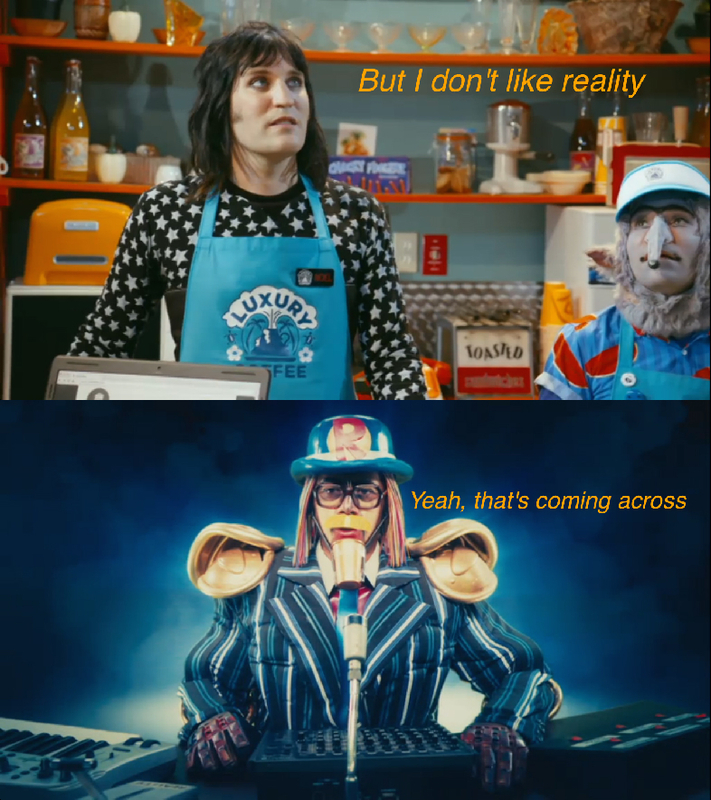 The Boosh crowd always talk about creating a film, and releasing an album, so we can all cling on to the hope that we haven’t seen the last of this whimsical universe either. One of the funniest moments from the whole 28 series of Never Mind The Buzzcocks so far was undoubtedly that time Noel Fielding ripped apart Dappy from N-Dubz. The rap singer apparently seemed to confuse a lampshade with a hair style. Easy to do, I suppose. As it was pointed out by Noel, it’s “not very difficult” to outsmart Dappy, it seems. This may have happened years ago, and I’m sure he’s a reformed character now, but I still reminisce of that encounter on a regular basis. However, the teams on Buzzcocks usually get along very well, particularly when slightly strange guests are present, such as the likes of comedians Adam Buxton, Tony Law, Paul Foot and James Acaster. 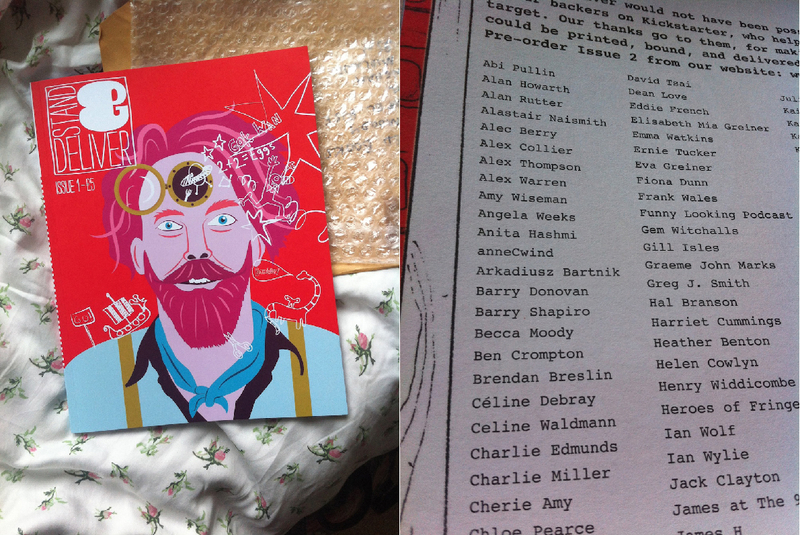 In October of last year, I was given the opportunity to interview my idol for the British Comedy Guide. Noel and I talked about the first few shows of his first live tour in five years, An Evening With Noel Fielding, as well as the reaction to both series of Noel Fielding’s Luxury Comedy. I also found time to ask the question that not enough people have been asking: what on earth happened to Daddy Push? As it stands, I am a very inexperienced interviewer, but Noel made our chat stress-free and we had a laugh, as well as giving lots of insight into the workings behind the comedy and his plans for the future. I went to see An Evening With Noel Fielding in November 2014 at Birmingham’s Symphony Hall. This show is unlike any other; it’s a remarkable spectacle. It’s strange to look back over events and realise the vast expanse between the show’s humble, low-key beginnings with just Fielding on stage, to a mission in a plasticine world with a couple of deluded nitwits riding on a unicorn. I even got to meet Noel, Mike and Tom after the show, which topped off the whole fantastical dream that was this insane evening. Feel free to join me in wishing Noel Fielding a very happy birthday; here’s to another year of absurdity and childishness, we look forward to it. 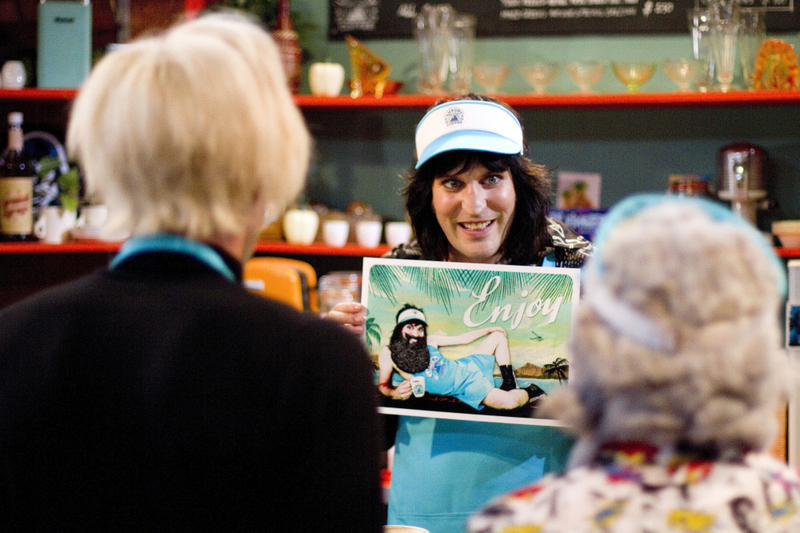 Yesterday, on the 24th of July, 4OD previewed the first episode of Noel Fielding’s Luxury Comedy: Tales of Painted Hawaii, which was, of course, greeted with open arms by the Fielding community. Noel has previously said that this series took a lot longer to write than the first, and that audiences should be prepared for a very different show format. 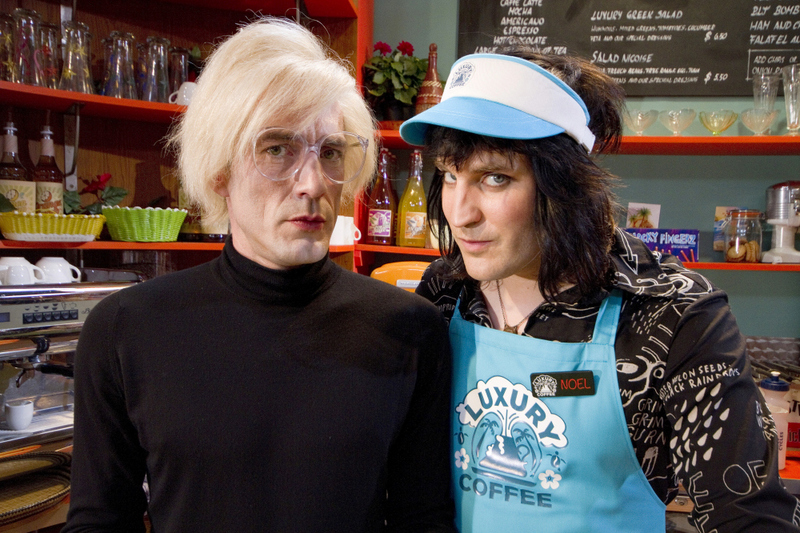 This is down to the fact that the making of series one of Luxury Comedy was a chance for Fielding and the other creative minds behind the show to throw lots of ideas into the mix, as well as there being an obvious need to establish a few core characters and concepts, and as a result, the show’s debut was a colourful combination of the insane and the psychedelic. Although this first series was adored by fans all over the world, it also received a fair amount of criticism from people who thought it was a step too far and many suggested it was self-indulgent. I can’t say I disagree with the latter, but I wouldn’t say it was a bad thing: it is important that creators of content are in love with what they are producing, and I think Fielding’s passion for both art and comedy shone through. From what has been shown of series two, however, Luxury Comedy has evolved into a wonderful sitcom, rather than the fast-paced sketch show it was previously. By approaching the format in this way, Noel and Nigel Coan (who co-wrote the show) have been able to add a great deal of depth to all the characters, which is evident from the first episode alone. There is a fresh new energy within the cast, that is made up of Noel Fielding, Mike Fielding, Tom Meeten and Dolly Wells, but still has the same feelings of warmth and familiarity of previous episodes. Actually, there are many subtle changes as well, such as the way Noel is much more self-depreciating and, therefore, more ‘human’. That is a definite theme I picked up on: the show has suddenly become a lot more human. This is made clear in the dialogue where characters often refer to the audience, or the fact that the show didn’t have many viewers (though it did, of course). With the immense talent that is Serge Pizzorno (Kasabian) working with Noel to create the show’s music and the famously gifted Dave Brown putting together the unique and recognisable animation, the programme is absolutely seamless. Subsequently, right at the start of this first episode, with the title sequence that features efforts from both sides, there really is a lot to sing and dance about. I cannot wait to see the rest of the new series of Noel Fielding’s Luxury Comedy and will probably write up a full post about it when it finishes as I just can’t help myself; Noel is my idol.